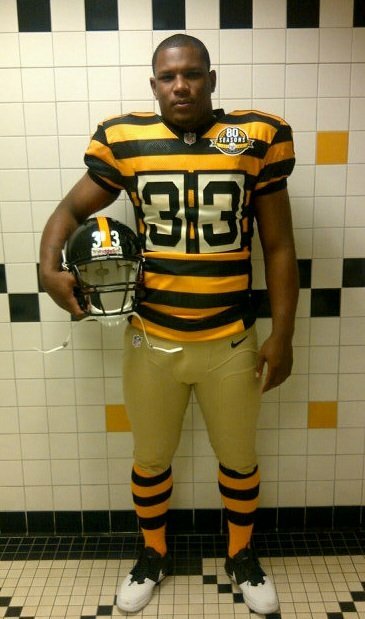 *The Steelers will wear an “80 Seasons” patch and a throwback jersey. *The Redskins will celebrate an 80th anniversary and also wear a throwback. *The Texans spotlight their “10th anniversary” season with a patch. *The Chiefs will celebrate their 50th season in Kansas City. *In weeks 14 and 15 (Dec. 6-17), all teams will wear a patch to honor the 50th anniversary of the Pro Football Hall of Fame in Canton, Ohio. *The Bills will wear their “Toronto Series” patch on Dec. 16 hosting Seattle at the Rogers Centre. *New England and St. Louis don the “International Series” patch when they tangle in London on Oct. 28. *The Eagles will wear a helmet decal with the initials “GR” in memory of Andy Reid’s son Garrett. They did not wear it for their pre-season opener Thursday against Pittsburgh. The Chargers will wear a decal and patch with the number “55” to honor Junior Seau, they did not wear either in their pre-season opener Thursday night against Green Bay..
*All teams will wear the pink Breast Cancer Awareness Month ribbons in October, and camouflage decals during weeks 9-10-11 (Nov. 1-19) in what the NFL is labeling as “Salute to Service” games honoring those in military service. Authentically Speaking Trivia Time: In the 1956 NFL championship game at Yankee Stadium, the home town New York Giants wore white jerseys against the visiting Chicago Bears who wore their traditional dark blue uniforms. Why did the Giants wear white at home? Answer on Monday. Thursday’s answer: Notre Dame wore Shamrock decals on its helmets between the 1959 and 1962 seasons under head coach Joe Kuharich. The Irish also wore almost identical looking Shamrocks as the original version for one game under current coach Brian Kelly on Sept. 10, 2011.